Among the numerous familiar websites at Penn, there are some that are new and some that are recently redesigned, including these three, which provide a look at some of the many extra-curricular activities available to the Penn community and the public—from arts and culture to athletics and the newest venue World Café Live which will open this coming weekend. A new web site for Arts and Culture at Penn has been created—www.upenn.edu/pennnews/artsandculture/. The site displays a wide array of the most engaging upcoming lectures, art exhibits, and forums at Penn on its homepage. In addition, the site links to a number of the top-flight cultural institutions throughout campus including literary arts, museums and galleries, music, theater, dance, and film. There is a link to the academic degree programs included on the site. Other site links include the event calendar, directions, shopping and dining as well as other cultural attractions in the area. 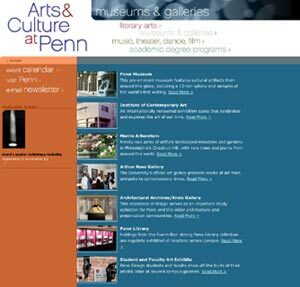 You can sign up for an e-mail newsletter to notify you of updates, and special offers from Arts & Culture at Penn. 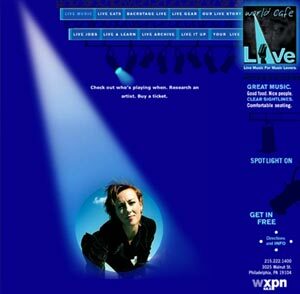 Another new web site is the World Café Live, www.worldcafelive.com/. The new World Café Live at 3025 Walnut St. will redefine the standard for live music at its new state-of-the-art installations. WXPN also shares this newly rehabilitated building. The building opens on October 1 with Jonatha Brooke giving the first public performance at World Café Live on October 2. Tickets are available online. The site lists upcoming live performances with dates, time and price of tickets. Additionally, updates on job listings, private parties, upcoming family activities, and other miscellaneous events will be sent to those who register at the site. By registering, WXPN listeners will receive a free pass to a Live Access session at the studio. Penn Athletics, in partnership with New Media Networks (NMN), launched a new web site—www.pennathletics.com—this past summer to incorporate the new brand for Penn Athletics that Penn's Business Services Office and SME, a New York branding firm, helped to develop. "We have been working hard to bring this new look to the fans of the Red and Blue," Director of Athletic Communications Carla Zighelboim said. "Alumni, parents, student-athletes and Penn fans will see more and more exciting additions to www.pennathletics.com over the course of our first year with NMN. Visit often and we look forward to the 2004-05 academic and athletic year and also to everyone's continued support of Penn Athletics." - ability to purchase Penn Athletics merchandise— t-shirts, hats, sweats, travel gear, etc. - schedules, rosters, features and records of all 33 intercollegiate athletics teams.